Cape Town’s Densification Strategy aims to make the city more efficient and more sustainable – as well as offer a broader range of living environments – by following a ‘middle path’. The idea is not to create a city as dense as New York City, London, Cairo or Mumbai, or to propose a ‘one-size-fits-all’ plan. Instead, the idea is to create a more compact city that operates well for everyone. 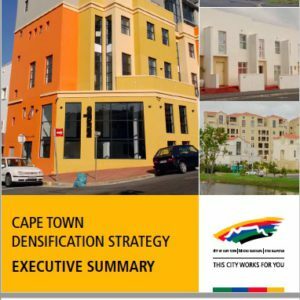 In August 2009 I prepared and published a synthesis of the Cape Town Densification Strategy for public comment, for the City of Cape Town.